See what she did there? It’s a full week of meals! And, yep, you can even submit product reviews! Our Vegitable really showcases the recipes and the bloggers who created them. Just like the other food photo sites, you can pick up a badge to add to your blog that will send your readers straight to your gallery of photos. Consider this your engraved invitation to submit your recipes! For the full details on how/where to submit your yummies, go here. Oh, and this soup here? I submitted it. A rich and creamy potato and cauliflower soup that is the perfect comforting warm-up for blustery fall days. Preheat oven to 450-degrees F. Coat cauliflower with the 1 teaspoon olive oil and place in a shallow baking pan. Bake for about 30 minutes, turning once, until browned and tender. Set aside to cool slightly. In a large pot, saute the onions, thyme, smoked paprika, and garlic in the Liquid Aminos and water/broth for about 5 minutes. Add the potatoes, vegetable broth, water, bay leaf and pepper. Cover the pot, reduce the heat and simmer for about 30 minutes or until potatoes are very tender. Remove the bay leaf and discard. While the potatoes cook, put the roasted cauliflower in a blender with the non-dairy milk, vegan Parm, nutritional yeast, and process until very smooth. Pour this mixture into a large bowl. Once the potatoes are very tender, carefully blend in batches and pour into the bowl with the cauliflower mixture. Pour it all back into the pot and gently warm, adjusting the seasonings to taste. Divide soup into bowls and top with green onions and coconut bacon. Looks delicious and belly warming on a cold winter day. I’ll have to duckduckgo Coconut Bacon – you mention it like it’s so common… I feel left out, totally ignorant having never heard of it before. that looks like a perfect soup with that coconut bacon on it. Interesting, Richa! I’ve never seen that spelling before. I think the name is very clever. And it sounds as if she’s starting to get lots of submissions :-). This soup is So me! I can just imagine it simmering on the stove top on a cold day and the smell of those potatoes making my stomach growl….yum! I’d add a big pinch of black pepper to my bowl (never waste an opportunity to make food spicy) We’re in our first cold snap here in D.C. and this sounds like it will be dinner Wednesday night. Love the splash of Braggs! Oh yeah, gotta have black pepper with potato soup. Today I’ve got one of Kathy Hester’s soups simmering on the stove – can’t wait for lunch! I have this one on the stove now…smellin’ awesome. I left the potatoes in cubes though. Perfect for a soup salad night..inside…brrrrr! I’ve been needing to make coconut bacon – this looks like the perfect recipe! Once you try it…you’ll want to put it on everything! What a beautiful looking soup, and that blog sounds like a great idea. I think Danielle had a great idea. Just another way to build a nice community :-). Have you got a big dinner planned? Just me and Kel this year – kinda happy about that. No stress! Us too! We found out a few weeks ago it’s hard to travel, thanks to the new puppy. He’s a big boy and hard to handle! So we get the stress-free holiday with great food and wine…and lots of relaxation. Happy T-Day! 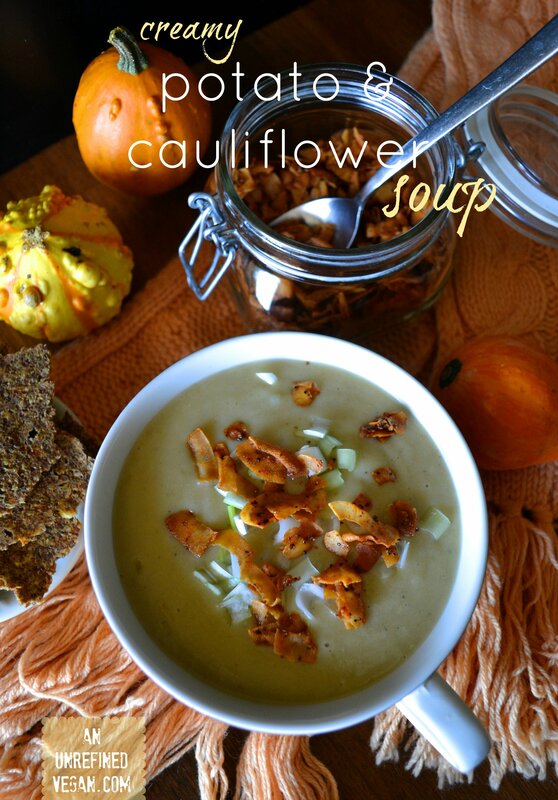 And I love this soup, cauliflower and potato are among my favourite vegetables! That looks delicious! I love coconut bacon on anything. Absolutely gorgeous, Annie! I love creamy soups with cauliflower. They make me smile. I love soups – they are my favourite winter dish. This one looks really great. Coconut bacon – – I want it on everything now! PS how was your vacation?? I find that plant based meals are so much more desirable to recreate and enjoy for me and the photos are always amazing! It’s like a mini challenge too being able to share with non plant based eaters and having them love what you’ve made! The perfect winter soup – yum and with coconut bacon on top 🙂 Im in love! This soup looks great- I can’t get enough of soup when it’s cold!! I love the sound of our vegitable -will definitely be checking it out! I could eat soup every day of winter! Yes, please do submit your recipes/photos to Our Vegitable!